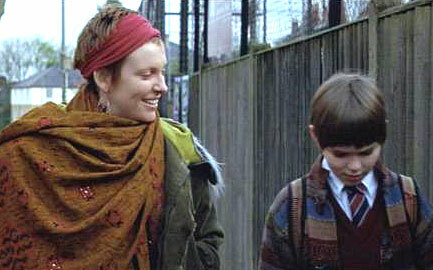 Toni Collette and Nicholas Hoult, About A Boy (2002) screenshot, June 14, 2012. (http://www.movieactors.com). Twenty summers ago was my last summer at home — 616 East Lincoln Avenue — for more than a visit. It was the long, hot summer of ’92, two months in which my master’s-degree-earnin’, twenty-two year-old-self reverted to my teenage years. At least, in terms of the responsibilities that I carried beyond taking care of myself, dating or clubbing, working or going to school. And it was a painful two months of submergence, revealing to me that I’d long since been on my own. Too long to be happy to play the role of big brother, young uncle, surrogate father, and my mother’s confidant all rolled into one. I ended up in Mount Vernon that summer after an unsuccessful search for work in Pittsburgh in the six weeks between the end of the school year and the middle of June. At the last minute, I contacted the Director of Westchester County Government’s Department of Community Mental Health, hoping (and knowing) that he could toss me some work. From him, I found out that the work I’d done at the Mount Vernon clinic in ’89, though successful, hadn’t been followed up with improvements in the front office or in billing. Once again, I’d be working as a senior summer intern with Valerie Johnstone and a group of wacky psychiatrists. I knew it would be a bumpy ride, as I’d only been home a total of thirty-five days in the previous two years. But I hadn’t counted on my mother acting like I was still a senior at Mount Vernon High School. Right from jump, I found myself constantly being nagged about how I trimmed my mustache, the “baggy” pants I wore, who my friends were, who I did and didn’t keep in touch with while I was back. Boomerang (movie) poster, 1992, October 31, 2007. (Alessgrimal via Wikipedia). Qualifies as fair use under US Copyright laws because this image is a low resolution copy. That wasn’t all though. 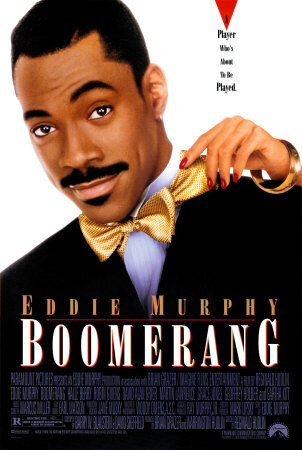 One Saturday night that July, I decided to go check out Eddie Murphy’s latest movie, Boomerang. It had more good reviews than bad, and I just wanted a night to myself, to just be myself. I told my mother that I’d be home late. I didn’t get in until about 2 am. To my surprise, my mother was awake, in the living room, waiting for me. “Where havey ou been?,” she asked, as if I had a curfew. “I went to see the movie down in the city, I hung out, I walked around, and then I took the last train back,” I said, with shock. “When you said late, I was thinkin’ 12 o’clock,” my mother said in response. I was pissed. As many Friday and Saturday nights I spent during the ’80s tracking down my father Jimme for $50 or to pull him out of some dive in Mount Vernon, the Bronx or in Midtown Manhattan. I was a teenager then! I’m an adult, and now I’m supposed to be home by a certain time? I took the iron away, and finished what I started, all with the b-word in my head. My mother knew what was in my head, too. “You can think it, but you better not say it!,” she yelled as she left the room.It was the first time I ever found myself thinking that way about my mother. Unfortunately, it wouldn’t be the last. Of course, the word that was really in my head most of the last summer was weird. Everyone around me seemed weird that summer, especially my mother. She was overprotective, in my business, and talking to me about gettin’ filled with the Spirit more than usual. Or was it me that had become weird? After all, I’d been in the role of the dutiful son for so long that it probably was weird for my mother to see me go out to see a movie, hang out with a friend, or go down to the city at night. Maybe, at least in my mother’s case, she simply wasn’t used to me carving out time for myself, to actually act like the adult male that I had become.